» NHL Grab Bag: To Trade or Not to Trade? They narrowly beat out teammate Jonathan “Nelson Who?” Bernier for third spot. It’s the little gingerbread men that really seal the deal. The fired Senators coach gave a farewell press conference in which he quoted Taylor Swift and was then interrupted by a rather, um, enthusiastically NSFW fan. They made a Christmas video. It was … well, it was this. This video led to my getting flooded with requests to use it in this week’s YouTube breakdown. That’s not how it works, people. We’re working through a 30-year backlog of hockey shame here; you can’t just put on an ugly sweater and jump the line. Besides, there’s already an undisputed champion of the novelty hockey song genre, and this week we’re going to see how the Sharks stack up. More on that in a bit. Instead, let’s go with winger Denis Chasse, who gets the honor for a few reasons. One, his name was super fun to say because it rhymed with “sas-sy!” And two, he played for four NHL teams in four years and was traded four times, which isn’t easy when you think about it. The guys he was traded for compose another laundry list of obscure players, including Bob Bassen, Rob Pearson, and Stewart Malgunas. He was also once traded away from Ottawa along with a sixth-round choice, which the Senators later reacquired and used to select Chris Neil. Needless to say, they didn’t bother reacquiring Denis Chasse. He lasted 132 games in the NHL, scoring 11 goals and 25 points. He wasn’t really a tough guy, but he did have 256 PIM in 92 career games for the Blues, presumably because opponents mistook him for Kelly Chase. Here’s a clip of Warren Rychel charging halfway across the ice to pitchfork him in the groin, which I recommend watching if only for the mugshot of a young Brian Burke. Say it with me: Chasse! This week’s debate: Your favorite team is on a losing streak. Should it make a trade? In favor: If the team is bad, you need to improve it. Trading in today’s NHL is almost impossible, as we’re all constantly reminded, but I guess you’d have to at least try. Opposed: Whoa, whoa, whoa! You saw the part about the losing streak, right? You never make a trade when things are bad — that’s the worst possible time to make a move. Everyone knows this, because it gets repeated endlessly whenever a team hits a bad stretch. You don’t make trades unless things are good. In favor: Well, hold on. When things are going well, you’d be crazy to risk disrupting your momentum with a trade. Never mess with what’s working. Opposed: Yeah, good point. So definitely no trades when things are good. Opposed: But also no trades when things are bad! In favor: Sure, that sounds fair, too. Opposed: OK, glad we worked this out. Fan: Uh, guys? Could I interject here for a second? In favor: If you must. Fan: Can I just point out that you’re basically arguing that NHL GMs should never make trades, ever? In favor: What? No. We’re certainly not saying that. Opposed: Whatever gave you that idea? In favor: We’re just saying they shouldn’t ever make trades when things are bad. In favor: Pretty much never, yeah. Opposed: But we’re just talking about right now — the first few months of the season. There are other times to make a deal. Fan: So, when would you recommend? At the trade deadline? In favor: Oh no. Not the deadline. Opposed: Prices are way too high then. Everyone knows this. In favor: No, everyone likes their roster in training camp. Opposed: And the lineups are pretty much locked in by then. In favor: Well, cap space is pretty tight once free agency starts. Opposed: Yeah, no can do on the offseason. In favor: Uh … draft weekend? In favor: That’s pretty much it. Fan: So just so we’re clear: The only time that it’s reasonable to expect an NHL GM to make an actual trade is draft weekend. Three whole days out of the year. Opposed: Well, two. Everyone’s gone by Sunday. In favor: Got to catch those early flights. Fan: Right. See, this is kind of frustrating for fans to hear. Trades used to be a huge part of what made the NHL fun. Now we’re told that we should just accept that they’re basically extinct. Opposed: Well, what else can GMs do? Fan: I don’t know. The cap complicates things, and so do no-trade clauses and parity. But these guys are paid millions of dollars to build rosters that can compete for the playoffs and ultimately the Stanley Cup, and it seems weird that we’ve all just collectively agreed to take one of the very few tools in their toolbox right off the table. Call me crazy, but maybe, just maybe, these guys could get off their butts and do their actual jobs? The final verdict: Sorry, fans, your favorite team will never make a trade ever again. This week’s hockey pool owner we all hate is the guy who picked up Martin Brodeur last week and is a little too proud of himself about it. Nice job working the waiver wire there, champ. Do you know why you had the first pick? Because you’re in last place. Maybe ease up on the back-patting. Also, we all know this is 2014 Martin Brodeur, not the 2003 version, so settle down on the trade offers. He’s off to a nice start, sure, but I still think I’ll pass on Rask-for-Brodeur. OK, Washington Capitals. Show these young San Jose whippersnappers how it’s done. 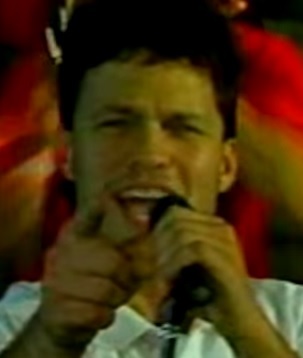 • Cheesy team music videos have become a staple of this section: We’ve covered “Red Hot,” “The Leafs Are the Best,” and “Shaybu Shaybu.” But the Capitals were the undisputed kings of the genre. We’ve already looked at “More Than a Team,” but they were downright prolific, filming at least four terrible videos in the late ’80s. 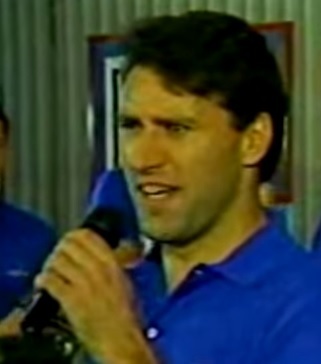 This one, from the 1989-90 season, is called “Capital Feeling.” It’s awful. Enjoy. • We start off with some highlights of big hits. The third one is of a Washington player getting elbowed in the face. I don’t think you get how highlights are supposed to work, Capitals. • We also get a bunch of goalies attempting glove saves. Notice how all of them have three feet of wide-open net behind them. It looks weird until you remember that every goalie in the 1980s was 6 inches tall. • Our first singer is Dino Ciccarelli, who is quickly joined by Rod Langway. I want you to watch this part closely. 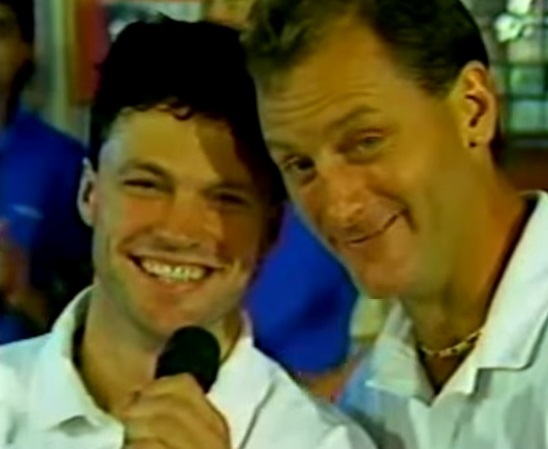 Look at how Langway leans in, watch how Ciccarelli suddenly starts laughing uncomfortably, and then note the weird face that Langway makes. • Notice that this has all the classic trademarks of a Capitals music video: color-coordinated shirts, lip-synching by different players even though the actual singer never changes, and guys playing instruments that don’t match the song. • Maybe pull the camera back a little from super-intense Geoff Courtnall there, guys. • Next up are Dale Hunter and Scott Stevens. Nobody tries to grab their bums, because nobody wants to die that day. • Oooh, it’s dueling keyboards, featuring Kelly Miller and Dave Christian. It’s a tight battle until the end, but Christian’s slide move takes the decision. • And here comes the highlight montage. The Caps are facing the Flyers, and they’re … hey, wait a second, this looks familiar. They wouldn’t have, would they? (Checks.) Yep. These are the exact same highlights as the “More Than a Team” video. Come on, guys. Hasn’t Ken Wregget suffered enough? • I looked it up: They’re from the season opener, a 5-3 Washington win. Don’t say I never do any research for you guys. • Based on the logo on the wall, I’m going to go ahead and say this was filmed at Rod Langway’s sports club, which was creatively named Langway’s Sports Club. Again: research! • Do you think they even tried to explain to Stevens that they didn’t need backup vocals on the lip-synching? Or did nobody ever have the guts to even mention it, kind of like how the hair on the top of his head was a completely different color from the rest of it for the first decade of his career? • Ciccarelli is enjoying this way too much. I think we all are. • By the way, every one of those trombone guys immediately went on the IR with a sprained back after having to do 400 reps of the one “up/down” move the choreographer bothered to give them. • The video ends with the sound of a siren, which was hopefully the police coming to arrest everyone involved. That’s how it’s done, San Jose.